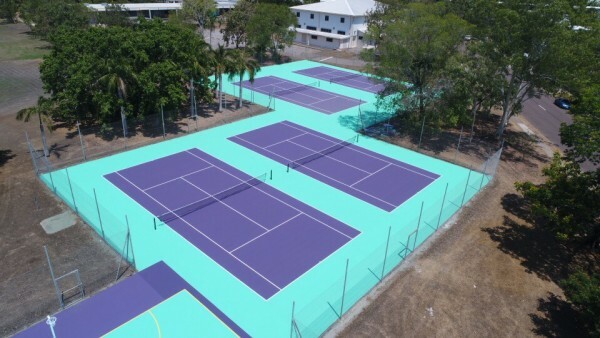 After consultation and the quotation process we were successful in award of this project, re-surfacing an area of approximately 4480m², comprising of four netball and four tennis courts. During the consultation process prior to commencement choice of colours for the surfacing were discussed and a decision by both parties was to provide something unique. We were able to provide them with the two-tone colour option as pictured and interchanged to distinguish between netball and tennis courts. The finished product speaks for itself. As the courts were already an existing asphalt surface, we ground and washed the surface in preparation for crack repairs to be carried out before resurfacing of the courts. Application of base coats and finishing top coats were then applied and on completion of the surfacing, line marking was done for tennis and netball, as well as installation of new tennis posts, tennis nets, netball hoops, and netball posts.